his books – on doing business with IBM Connections, user adoption strategies and building a collaboration roadmap. his incredibly thought-provoking workshops – I have been honoured to host a couple of these, in London and Zürich, and I’ve heard rave reviews from those that have attended other sessions around the world. his keynotes and sessions at conferences – such as at Social Connections. So when Michael mentioned that he had a new book about to be published, I knew that it was worth my attention – particularly as it covered a platform that has regularly caused myself and my clients both confusion and some consternation – Microsoft Office 365. There is no doubting the practical utility that the Office 365 solution provides, nor the comprehensive nature of the platform and the opportunity that it provides to Microsoft’s customers, and yet in so many cases I hear that somehow Office 365 as a collaboration solution offers less than the sum of its parts. As always, the immediate question that comes to mind is whether this is a factor of the technological solution itself or the strategic approach to implementation and adoption that has been used. Is it that Office is a square peg in a round hole (using a productivity tool to aid collaboration? ), or that with the correct analysis, approach and planning, it can offer real value in aiding digital transformation? Fortunately, Michael is stepping in to deal with exactly that issue. Understand the Business Opportunity. Explore the capabilities in Office 365 and what those capabilities could mean for organisations looking to embrace the philosophy and tools on offer. This book looks at eight of these opportunities. Make the Right Decision for Your Business on Office 365. Examine the pros and cons of moving to Office 365 in general, and look specifically at the decision context for your organisation. In light of where your organisation is heading, does a shift to Office 365 make business sense? Create the Context for Achieving Value with Office 365. Achieving value with Office 365 requires clear thinking on how to create the best organisational context for its introduction and effective use. Get clear on the purpose of embracing Office 365, and develop competence in building the supporting organisational constructs to drive success. Drive Effective Use to Reap the Benefits of Office 365. Decide how to introduce Office 365 to your people, and how to lead them to competence in the use of the tools aligned with productive behaviours. This book fits in the first box, and is thus a pre-decision or pre-acquisition resource to help with clarifying what’s actually possible. I got a lot of value from the book, particularly in terms of understanding how the newer aspects of the Office solution, Delve and Graph, fit in to the picture. As ever, Michael is fiercely independent in his approach, and is willing to discuss the issues and hurdles, as well as the benefits of the Office 365 solution, plus a number of “wouldn’t it be cool if” suggestions for future development. I also really appreciated the focus on the behavioural aspects of each use case, as well as the performance improvements that might result from correct deployment and adoption. Summing up, I believe that this is a guide that is much needed for those considering deploying Office 365 across their organisation. 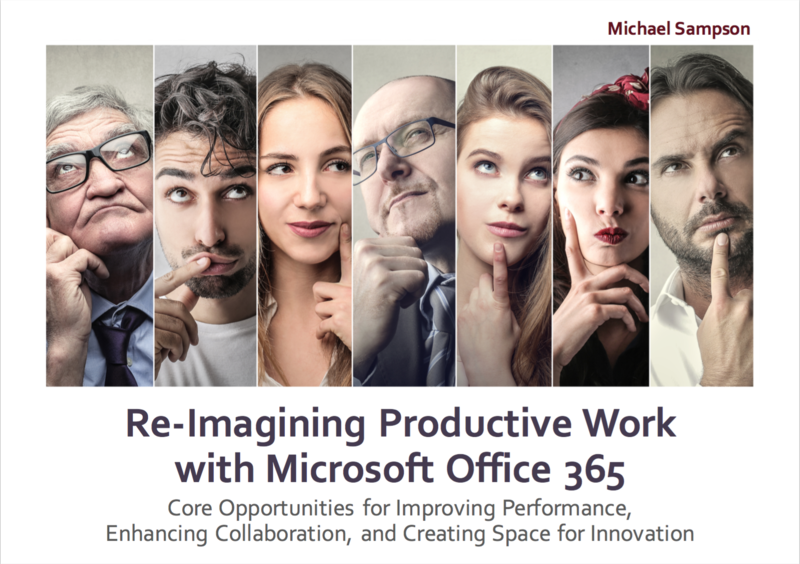 As Michael himself states, Re-Imagining Productive Work with Office 365 only deals with the first stage in terms of planning for adoption of Office 365, but for this specific scope, it is is a truly excellent resource. Recommended. Thank you for your comments above Stuart. Very much appreciated. I wish you every success in your new endeavours.